I probably can guess what are you thinking, "kitten heel mules slides are still around?" Well, let me say yes. They are still around, simply because they are practical, versatile (office-approved flip flops!) and surprisingly very stylish (Audrey Hepburn knew what she was doing). Well, the beauty about fashion these days is that pretty much everything is in style including the forgotten kitten heel slides. Now, let's just bring them up-to-date by wearing them with contemporary pieces and please don't forget compliment them with lady-like jewerly. Heels: Burberry (old). A funkier style here/Blazer: Banana Republic. Similar/T-shirt: Gap. Similar/Jeans: Zara. Similar/Sunglasses: Vintage Ray-Ban for B&L. Similar. 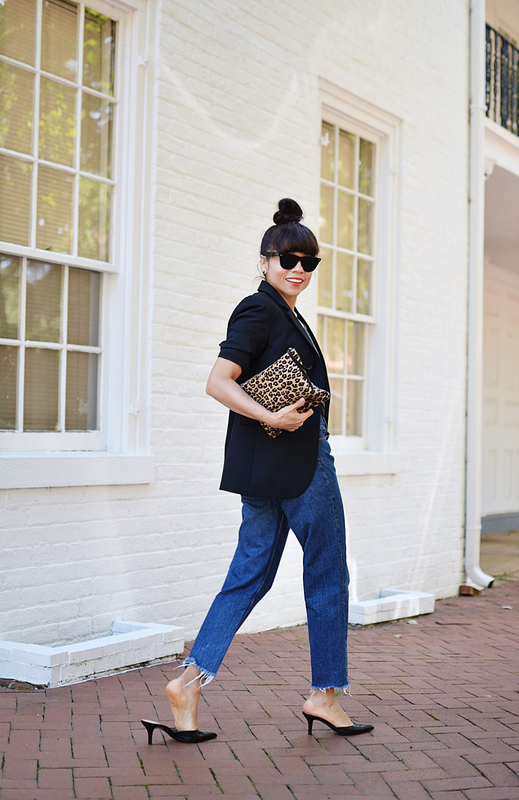 Kitten heel mules look great and give the illusion you are wearing higher heels imho. But can I say they make your feet and ankle so small and dainty that they would look even better with a skirt? Are they comfy? I guess maybe not, but I found it varies from people to people. Why they seem not to be worn anymore? Any idea?